No one better defined toughness at running back than Walter Payton. Highlight reels from his career see him in numerous incidents going out of his way to punish would-be tacklers before going out-of-bounds. His hard-nosed approach to the game and his notorious training regiment made him an instant favorite of Chicago Bears coach and general manager, George "Papa Bear" Halas. With a game that mirrored that of the classic Bears' Monsters of the Midway persona, the Chicago fans instantly fell in love with the charming and well-spoken Payton, a product of Jackson State University in Mississippi. Beloved by his teammates, "Sweetness" was always good for a locker room prank. He helped to reduce some of the stress players experienced during the grind of the NFL regular season and provided some much-needed levity to a team constantly under the microscope by its fan base. Selected fourth overall in the 1975 NFL Draft, Payton proceeded to win two NFL Most Valuable Player Awards and a Super Bowl title before retiring after the 1987 season. Payton was an easy choice for election into the Professional Football Hall of Fame. Payton left the NFL as the league's all-time rushing leader, breaking the long-held mark of Jim Brown. It was a record Payton held until Emmitt Smith broke it in 2002. 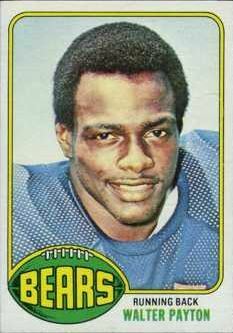 Easily his most recognizable and definitive rookie card, the 1976 Topps Football card depicts a full head shot of a youthful Payton. The bold team name in the foreground of a football and the contrasting green and yellow color made the 1976 design instantly iconic. Although this is his most popular card and widely accepted as the rookie card to own, it surprisingly isn't Payton's most valuable. Much rarer than Payton's 1976 Topps Football card is the 1976 MSA Saga Football Disc. The discs were created as a local Philadelphia School District promotion and were given out with school lunches. The regional distribution accounts for its rarity. However, because it was issued the same year as his Topps rookie card, it is a must-have for any Payton collector. This disc is similar to the more common Crane Discs (below) with an off-green color border and four black stars across the top. The border ring has statistical information and the back of the disc has an advertisement for Saga. Crane's Potato Chips was a food manufacturer in downstate Illinois that was eventually purchased by the famous Jay's Potato Chip Company in Chicago. 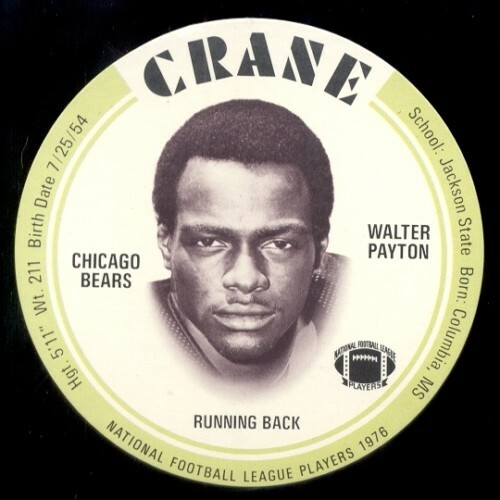 As with many food manufacturers of the era, Crane's produced a 30-card set in 1976 that included a then little-known rookie by the name of Walter Payton. While technically an oddball issue, due to Crane's national distribution, card #24 is still considered a rookie card. I am beginning my collection of Walter Payton FB cards. I’m looking for a complete checklist of cards that I can use to guide my collecting. Any insight you have would be greatly appreciated. 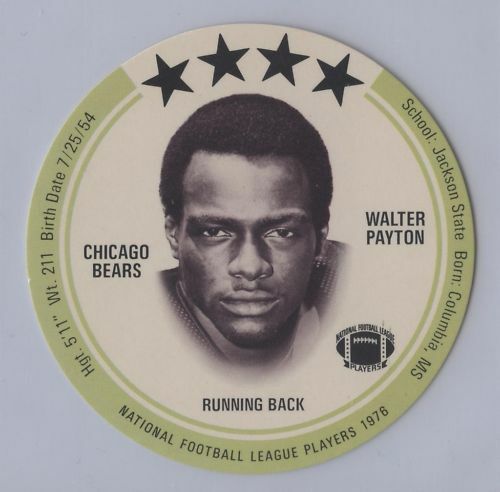 please tell me if this is a real Walter Payton card and if is the grading is accurate. Jacobo � A quick glance, even with a blurry image, show that centering is off. I’d be suspicious of legitimacy. Personally, I only trust graded cards from PSA, BGS/BVG and SGC as a whole. Other companies I’d be very leery of. Some are legit but don’t do so well on the secondary market.